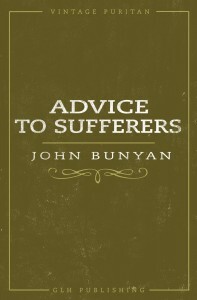 Having read as much of Bunyan that I could, including The Pilgrim’s Progress several times, I have to rate this lesser known treatise at least second to the great classic. The editor of the reprinted edition writes, “This valuable treatise was first published in a pocket volume in 1684, and has only been reprinted in Whitfield’s edition of Bunyan’s works, 2 vols. Folio, 1767.” Bunyan was especially qualified to write on suffering, spending almost thirteen years in jail for preaching the gospel and in constant fear of losing his life either by death or by unending incarceration. From that jail on the river Ouse he could see to the south the church where John Gifford (the “Interpreter?”) had led him to Christ; to the east he could see the place in the river where Gifford had baptized him; and to the north he could see the small barn-like building where his church met, and beyond that his very home where his wife and children waited for his return. When he was finally released he continued to pastor the small congregation for the rest of his life. Bunyan died after riding to London in inclement weather and developing a bad cold. He was buried in Bunhill Fields, the Dissenter’s Graveyard, rather than being returned to his home in Bedford.